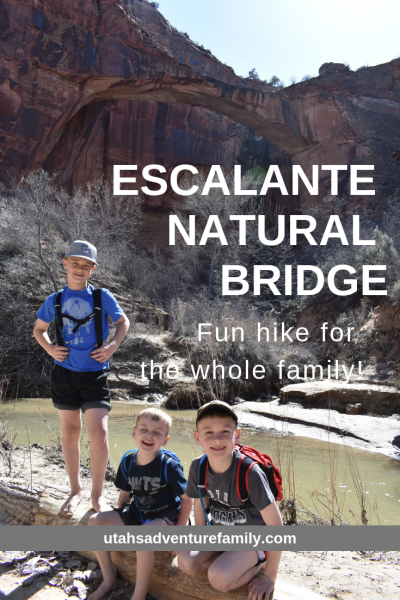 Escalante Natural Bridge is an amazing hike near Escalante, Utah. 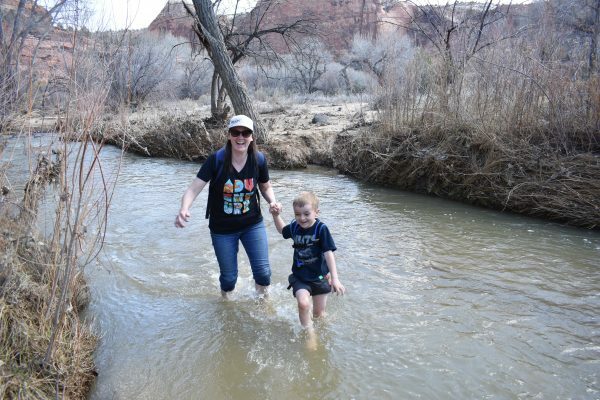 We really enjoyed the adventurous nature of this hike because it requires five shallow river crossings. The hike is perfectly flat (except climbing river banks!) and runs for just over three miles out and back. Tips: Be prepared for water crossings. Wear appropriate shoes and clothes. 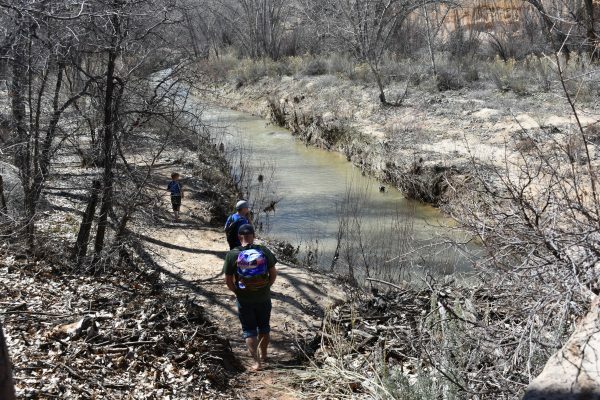 If the water is too deep or swift from spring run off, consider hiking this trail another time. 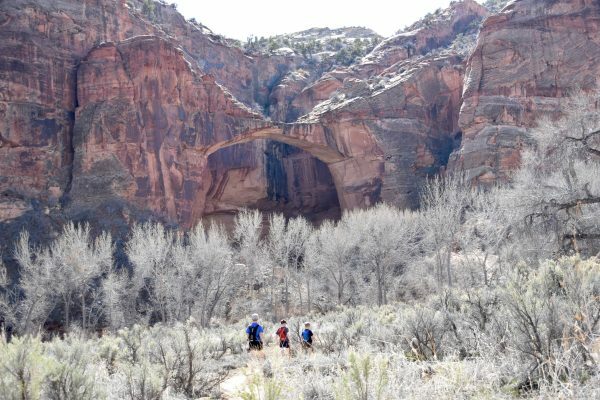 Our boys rated this in their top 5 favorite hikes! It’s best to be prepared for this hike with water shoes if possible. Your other options are to hike it barefoot, take shoes on and off, or get your shoes wet. We decided to hike barefoot. This was mostly okay as the sand is soft, but there were a few prickly bushes. We ended up with one sliver and a cut that bled a little. For this reason we’d recommend water shoes. The repeated sand and water would ruin decent shoes, and taking them on and off nearly a dozen times doesn’t seem like much fun. Flip Flops might even be an alternative since the trail is so flat and easy. 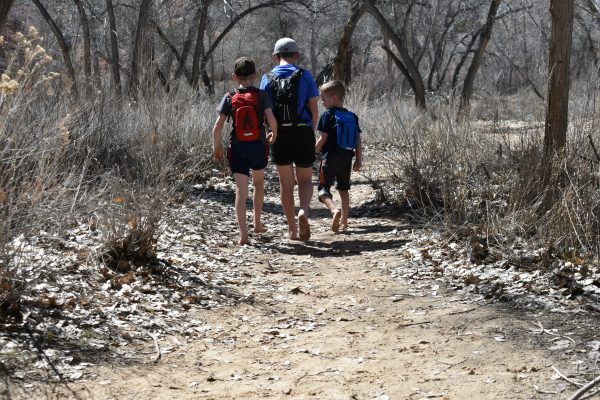 We are not normally barefoot hikers, but it worked for our family this time. 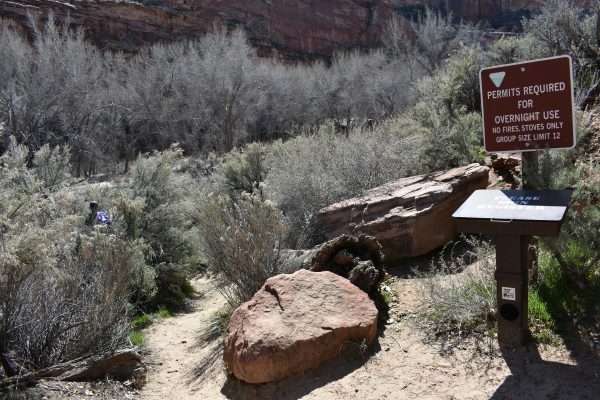 The trailhead for the Escalante Natural Bridge has a small parking lot about 13 miles from Escalante or if you are coming from the other direction, the parking area is 14.5 miles from Boulder along Highway 12. There is a sign, so it is easy to find. 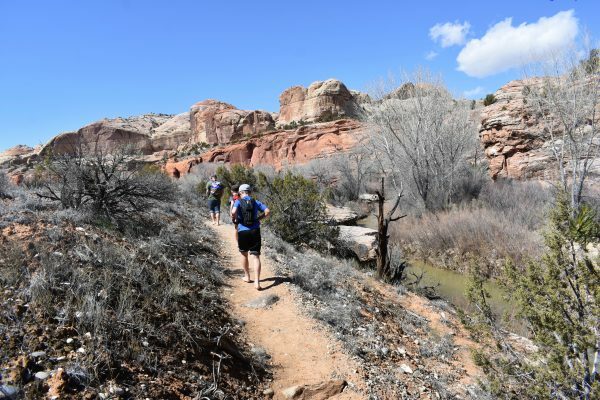 Lower Calf Creek Falls is just a few miles away from this trail. The hike begins here by the trail register, and the first river crossing is by those trees. The first river crossing is within 50 yards of the trailhead. It is also the most difficult crossing, so if you can do this one, you can do the other four easily. When we crossed in early Spring, the water was just below knee deep, but not too swift. The creek is about 20 feet across, and the bottom is smooth, but slippery. We always sent Dad across first to make sure the boys could make it. From there the trail turns right along the bank of the river. It is quite a while before you cross the river again, but someone has made a rather distinct false trail. This trail peters out after a few hundred yards, but don’t follow it. Make sure you go down through the river instead. There is a cairn on the far side of the river, so look for that. 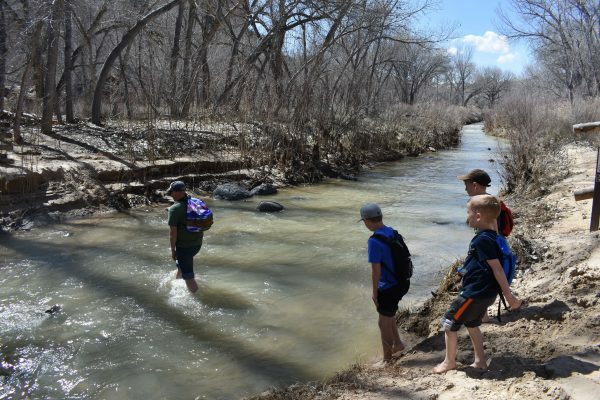 This river crossing fooled us. We followed that trail to the left, but you actually need to cross here. The trail follows the river off and on the entire hike. 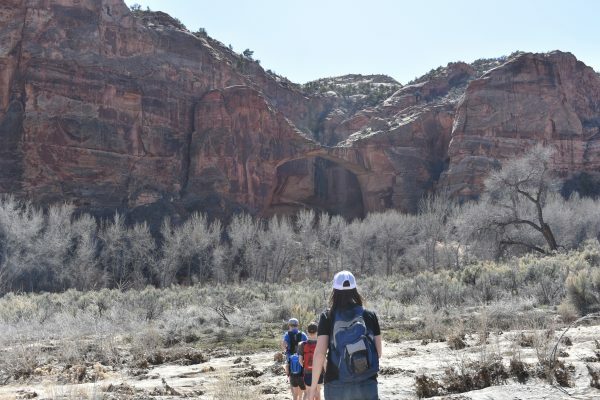 Make sure to enjoy the grand red rocks that surround this river hike. From the second crossing, the trail cuts away from the river, which loops back around. It cuts through the sagebrush and shortly comes to a new crossing. There are two other crossings before the bridge comes in sight, tucked back against the wall. It is quite huge, and if you look along the skyline to the right, you can see another sliver of an arch. 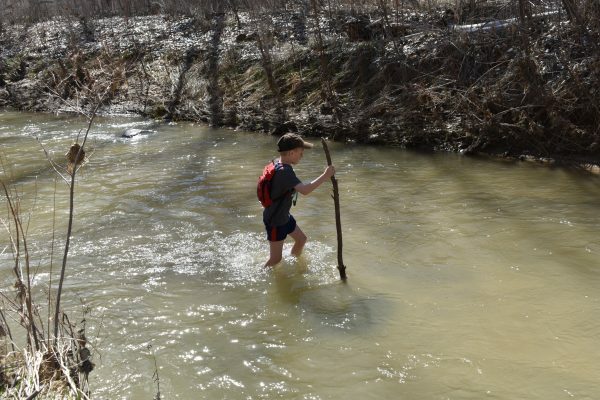 Sticks or trek poles would help with the river crossings, but they aren’t necessary. Watch for a few cairns when the trail widens out away from the river. We had so much fun on this hike! You can see a sliver of an arch in the distance. Then the Natural Bridge will come into view. 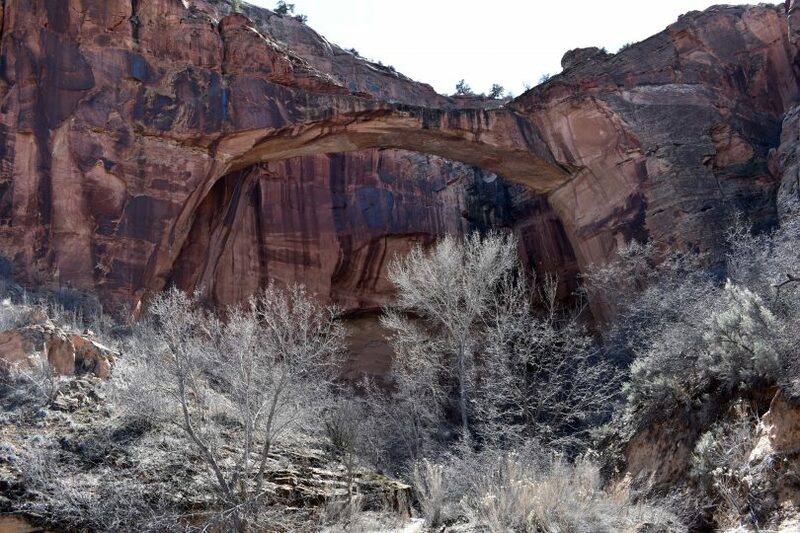 There are great views of the Escalante Natural Bridge as you walk the last stretch to get closer. When you reach the river for the last (and 5th) time, it looks deep and swift. You don’t need to cross, but despite appearances this crossing is no more difficult than the previous crossings. If you cross, there is a muddy sandbar on the far side. 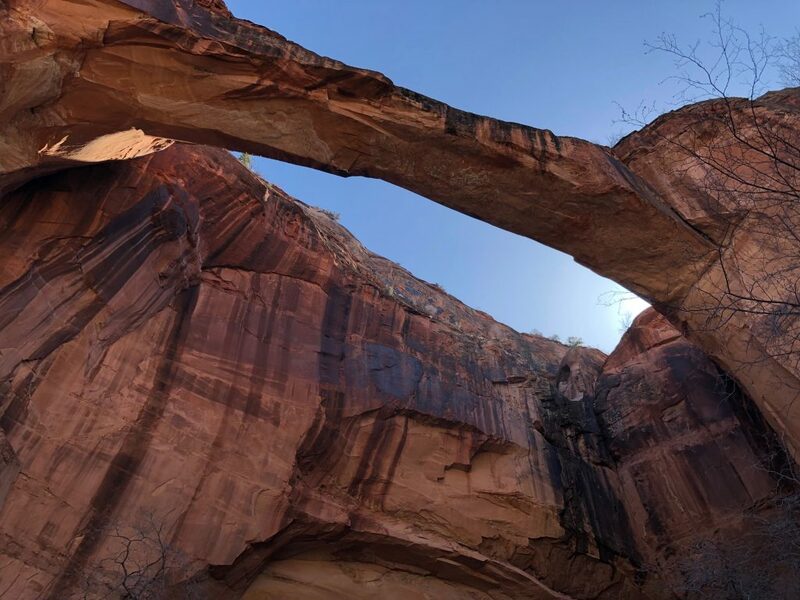 Beyond that, you can walk right under the Escalante Natural Bridge, which is the only way to frame it against the sky. It is really beautiful up close. If you cross the river the last time, you can get up close to the bridge. Spend a little time at this beautiful bridge and then turn around and make the crossings again. This hike is so fun and unique that we will always remember it. 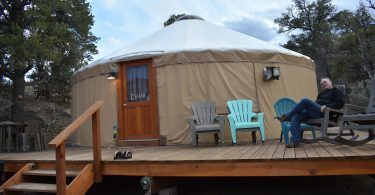 We’d love to do it again! 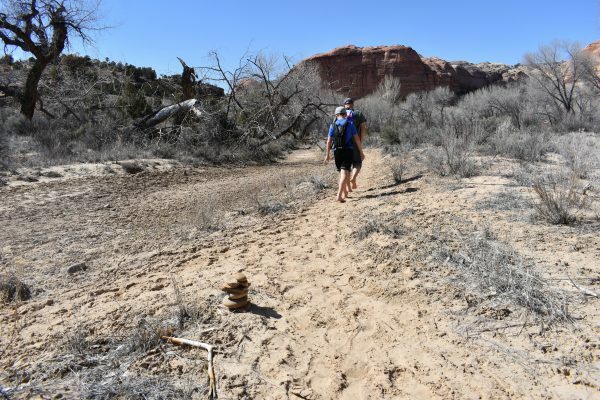 This trail is part of Grand Staircase Escalante National Monument. 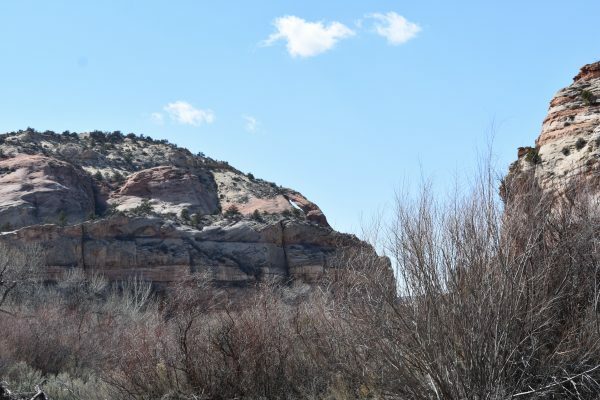 For other hikes in this national monument, click here. 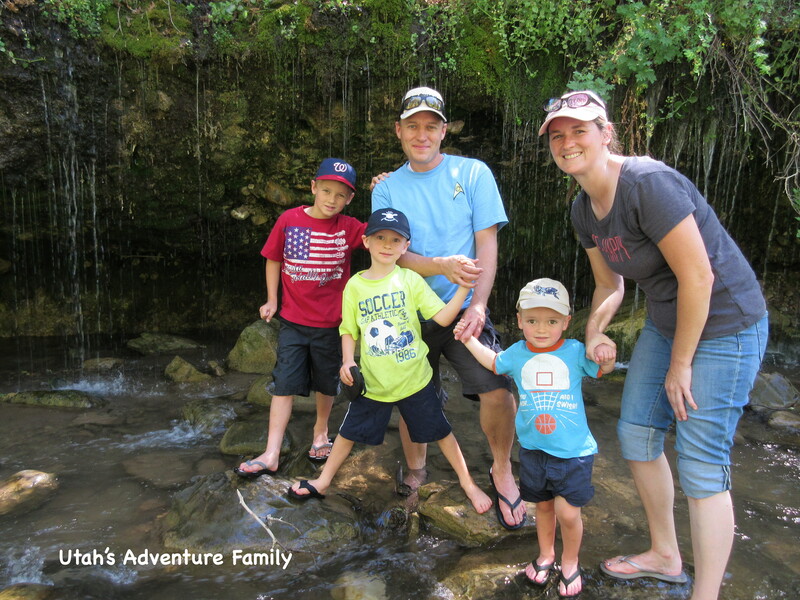 Or if you like hikes through water, try Kanarraville Falls or Willis Creek. Thank you so much for posting this! 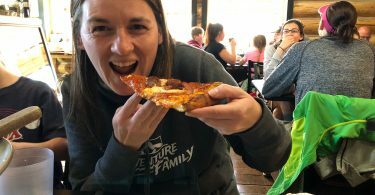 After reading your post we (my husband and 5 and 7 year old boys) did the hike. We loved it!! The ranger at the visitor centers gave us a tip to skip the first river crossing. This would be good for groups who aren’t really water shoe ready and don’t want to get wet within the first minute of your hike. Because you don’t need to cross for a long while after that. 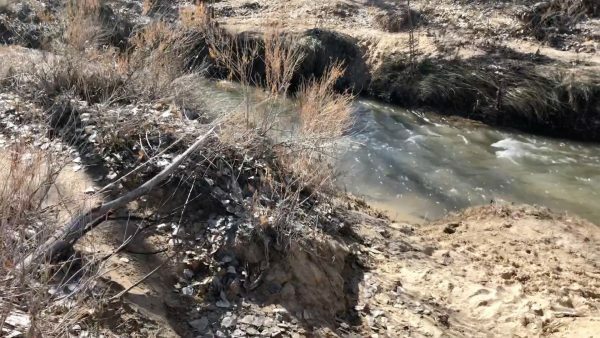 Anyways, if you get back on highway 12 and cross over the bridge (this the river), there is a way to get right on the path, without having to get wet. Thanks again for the recommendation! We did this after doing peek a boo slot canyon. Thanks for the tip about the first crossing and we are so glad you enjoyed the hike!